Maike battles through the best she can as the team conquers the toughest day on expedition so far! It literally was a marathon of a day. The road to becoming an Olympian has changed a lot in the past twenty years, let alone since the Ancient Olympic Games. The team discuss the modern day challenges of the Olympic dream. As the days roll on, resilience becomes more important. Finding companionship in each other is becoming key to making it through each and every day. It has been a wild journey so far. Day three saw 26km, 3300ft of elevation and maybe the coolest finish line of all - the original Olympic track! Ancient Greek Mythology is filled with enemies and companions. Upon reflect, our Youth Ambassadors realise our greatest enemy is actually our own selves. Companions? Well, they can be found all around us. Who do we turn to to learn life lessons? 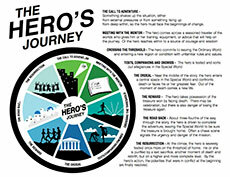 The Hero's Journey directly applies the challenge of 7 marathons in 7 days. Youth Ambassadors, coaches, educators and ground crew - mentors are everywhere! Flashback to Day One of Youth Expedition Greece. Stunning shots from the film crew as the Youth Ambassadors set off on the journey of a lifetime! The fatigue has set in, but the Youth Ambassadors persevere! Today's run has a unique finish line - the ancient Olympic Stadium!